Some shocked Wii U owners spread the word this morning that Paper Mario Color Splash, the only remaining big Nintendo-published Wii U game of 2016, was playable today despite it not technically going on sale until October 7. It’s common these days for retail copies of games to find their way to gamers’ consoles prior to release day, but this was something different. At 5:14 am ET, Twitter user Electivirus posted that those who digitally pre-ordered (and pre-loaded) the game to their Wii U console could play it. In follow-up tweets, Electivirus showed the game running on a Wii U. Usually pre-loading a game spares you from having to wait for a download to finish on launch day but leaves the pre-downloaded game inaccessible until launch. Some video games come in hot, barely getting finished in time for release and sometimes relying on day one patches to achieve decent functionality. That’s seldom the case with Nintendo games, which the publisher often provides to us in finished, shrink-wrapped packaging or via download codes one or two weeks before release. Color Splash is coming in even less last-minute than that. When we interviewed the game’s producer in June, she told us the game was done. “It’s complete,” she said. Yep. In June. 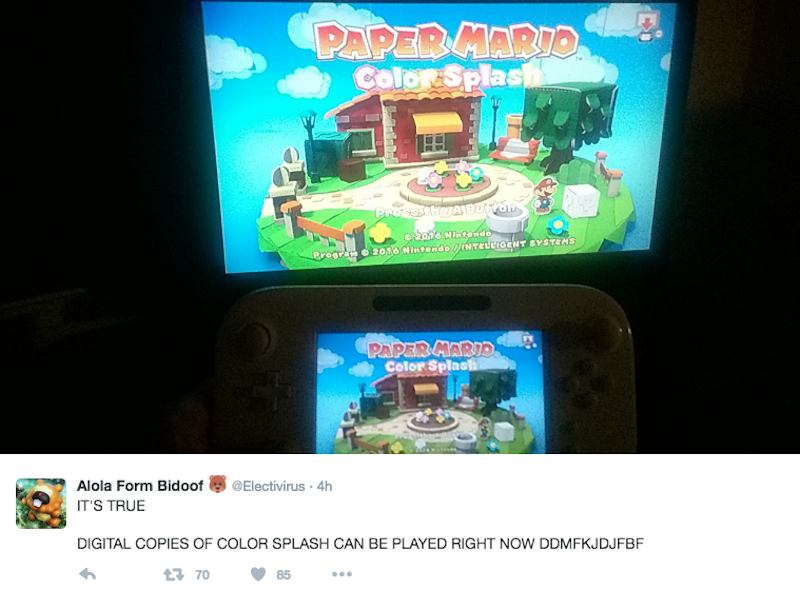 It’s likely that Color Splash’s brief early release was an accident, but we must acknowledge that it could also be a clever marketing plan. Many faithful Paper Mario fans have been grumpy about the direction the franchise has gone in, moving more toward action game and away from its role-playing origins. That led to YouTube trailer downvotes and social media complaints about the new game. What better way for something like that to become desirable? By accident or design, it can’t hurt to make it something you’re not yet supposed to have. Note: Best of luck to Electivirus with that driving lesson today!